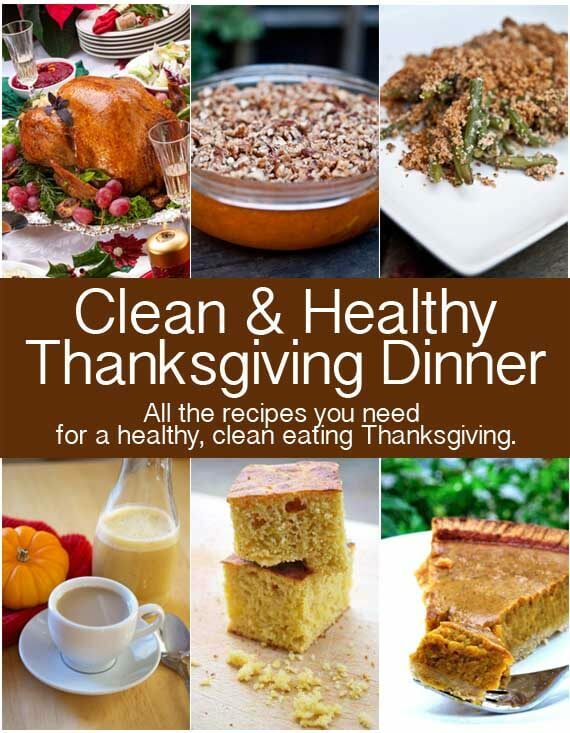 Ready for a clean eating Thanksgiving dinner? Thanksgiving is just around the corner. A day for family, eating too much, and either playing football or sacking out on the couch. My family has never placed a lot of emphasis on Thanksgiving. We keep our dinner relatively low key, and often times, will simply go out to dinner. Not a lot of preparation or high stress. Leave it to Americans to put a major holiday that close to Christmas. And I have to agree with her. You see, in Germany, “Thanksgiving” is in October when the harvest actually comes in. Of course, they don’t have Halloween, but that gives them the entire two months to prepare for Christmas. And believe me, it can take them the full two months to prepare. So you can see why my Mom is a little disgruntled with Thanksgiving. But now that Mini Chef is getting a little older, I’m starting to become a bit more inclined towards cooking a whole clean eating Thanksgiving dinner with all the fixings. My German upbringing is losing it’s hold, and this all-encompassing American tradition is squeezing it’s way in. I have tried to clean up a few dishes every year so that eventually I can do an entirely clean dinner. So here’s the collection I have so far. I’ll add a few more next year, and the year after that…. WANT ALL THESE RECIPE IN ONE HANDY DOWNLOAD? I have collected all my Thanksgiving recipes to date and put them in this handy ebook so you can have them all in one spot for only $5. Find it here. All ebook sales are final. Book is delivered via email with a download link and is in pdf format. I try to give you guys something free to go with your purchase. So here is a calendar to help you plan and get everything done for the big meal! Get it here. Haha!!! Hope you enjoy it then! I’m not making it for Thanksgiving this year, but I might have to make it just to have some “leftovers” around the house! Thanks for the good recipes!! I just wanted to add that my family farms here in the US (corn, beans, popcorn are what is done in the Fall; wheat in the summer). , and we just got done with harvest in the middle of November. Which is typically when we finish every year. So, Thanksgiving is truly right after harvest for us. 🙂 We would prefer October, too, but they are never done by then; in fact, my husband doesn’t even get to go trick-or-treating with my kids and I. bummer! Ashley – Wow! That is a bummer! I guess maybe farming practices are different here than they are in Europe? Or maybe it’s just the seasons. The site says the cookbook is $3.99 but when I go to the cart it shows $4.99 as the cost. I know it’s just one dollar, but which is correct? Bea – Sorry for the typo. It’s been fixed. The book is $4.99. Such great ideas! I’ll have to use this for Thanksgiving next year! Uh, I love these recipes already. We have a tendency to eat too much on Thanksgiving, at least we can guarantee some clean eating.